Japan's national broadcaster NHK reported last week that the country is actively pushing forward adopting the US' Terminal High-Altitude Area Defense (THAAD) system. It is very likely that Japan will become the second country in East Asia to deploy THAAD after South Korea. According to research, the real combat capability of THAAD is doubtful. But the Japanese government still considers deploying THAAD system on its territory regardless of the firm objection of China and Russia. The move is apparently not aimed at defending against North Korean missiles, but to serve its ultimate purpose of rectifying the pacifist constitution. The administration of Japanese Prime Minister Shinzo Abe has been attempting to revise the post-war constitution, especially Article 9 that renounces war and prohibits Japan from sending its self-defense forces abroad. But it faces huge domestic pressure and a deteriorating public support. By deploying THAAD, Japan can provoke China and North Korea so as to intensify the tense situation in Northeast Asia and gain public support for a "security shield." Besides, Japan can hype up China's countermeasures against THAAD deployment to ignite nationalism among Japan's right-wing forces and to stir up domestic hatred against China. This will help the Abe administration garner support for its planned constitutional revision. Assistance from external forces, such as the US, will undoubtedly help Japan in this regard. Deploying THAAD will enhance the alliance between Tokyo and Washington. Japan can utilize US political and military clout to achieve its aim of revising the constitution. Meanwhile, including more of Japan's military strength into US deployment in East Asia will lessen the US doubt toward Japan's purpose of constitutional revision. In this sense, THAAD deployment in Japan is more significant politically than militarily. Japan was supposed to deploy THAAD in 2018 after its Five-Year Mid-Term Defense Plan ends. But why does it get so impatient at the moment? Currently, the US presidential election campaign is underway. Republican candidate Donald Trump has made comments against US deployment in East Asia and once threatened to withdraw US forces from Japan. Therefore, if Trump is elected into the White House, Japan will bear the consequences. As the election is still hanging in the balance, making THAAD deployment a reality as soon as possible can reduce uncertainties. This shows the anxieties among the Japanese leadership about the future trajectory of East Asian politics. Meanwhile, deploying the THAAD system is actually feasible. After the Upper House election, the ruling Liberal Democratic Party and New Komeito have a guaranteed majority of Diet seats, and Abe has taken full control of the parliament. 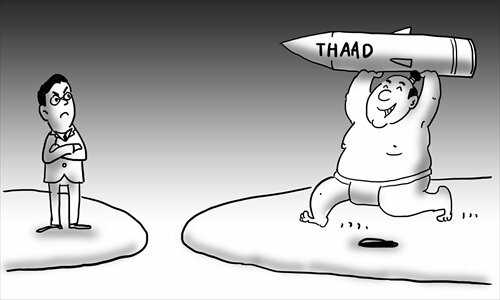 China is facing unfavorable landscape in the East China Sea, the South China Sea and the Taiwan Straits, while South Korea has already announced it will deploy the THAAD system. North Korea's missile tests also offered Japan an excuse to justify THAAD deployment. Against this backdrop, Japan can exploit this chance to serve its own ends. All in all, Japan considers deployment of THAAD system to fulfill its national strategies, which intend to recover the status of a "normal country" and become a political power with global influence again. This entails revising the constitution and hence requires Japan to create a chaotic and tense situation in East Asia so as to justify its actions. Deploying THAAD serves as the catalyst for achieving such a goal. Since the 1980s, Japan has gradually formed its strategies to resume its past glory. It wants to acquire political strength that matches its economic power and seeks a leadership role in the world. The strategy has taken hold despite the frequent shifts of its cabinet. Japan's diplomatic decisions are not passive responses but a reflection of its fundamental strategy. To better serve this goal, Japan stresses to integrate with the "international community," which, however, refers to the US-led Western camp. Japan is good at exploiting international law and rules to facilitate its strategic intentions. Japan's diplomacy is operably flexible and fraudulent. It is particularly so in the issue of THAAD deployment.